Are service providers taking fraud and revenue leakage more seriously today? As Jeremy Cowan reports, an unexpected finding is the changing seniority and profile of those responsible for controlling revenue losses. Until 2007 revenue leakage and fraud were often the responsibility of the chief executive or the chief finance officer and the Finance Department. Today there is more likely to be a defined team with revenue assurance responsibility and the role has devolved beyond the CEO’s office. In this survey 21% of respondents were heads of the Fraud Department, 15% were described as Team Leaders, 12% were heads of the Revenue Assurance Department, 10% were Fraud Analysts (there was no breakdown of internal or third party staff), and 8% were Revenue Assurance Analysts. CEOs, CFOs, CIOs, and CTOs each made up one per cent, and the remainder (30%) held other job titles. It’s not conclusive evidence, but it does suggest that a broader range of skills is being brought to bear on tackling the problem. The emergence of dedicated Fraud and RA departments could also be an indicator of a new determination – not evident in similar surveys from 2004-2007 – to curb this continual revenue loss. Significant failure factors include bad credit management, external fraud, fraud by other service providers, rating and charging errors, poor systems integration and internal fraud. These affect all kinds of network operators and service providers. The operators surveyed offer communication services ranging from 3G and 4G mobile, through broadband, fixed voice, and cable to MVNO (mobile virtual network operator) services over third party networks. They also range in size, with 6% having fewer than 100,000 subscribers and go up to those with more than 50 million subscribers (15% in this survey). In the middle, 29% have between one and five million subscribers. 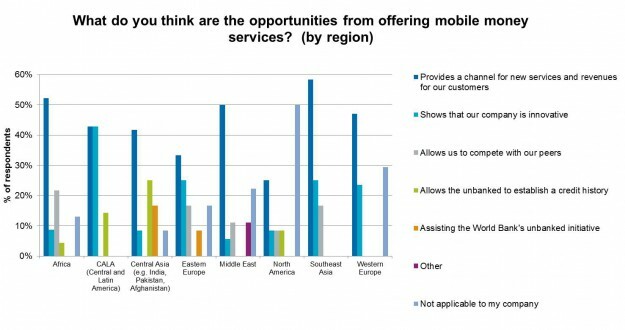 Expert bodies like the Mobey Forum expect 2016 to bring significant advances in mobile payments, so it’s interesting to see a regional breakdown in response to the question, Has your company implemented any of the following mobile money services (contactless payment/e-wallet, branchless banking, and money transfer)? The large number of such services already launched is going to impact the revenue streams not just of mobile network operators but also will be a key factor in the success (or otherwise) of consumer IoT services. Then compare it with the positive answers to the question, What do you think are the opportunities from offering mobile money services? A hint of concern from the challenges of offering such services can, however, still be seen in the slide below.